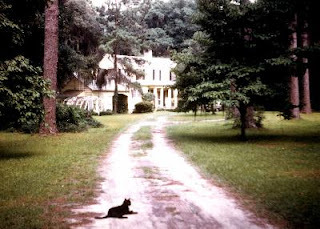 Johnny Mercer's house at Moon River where I lived in the early 70s. Fergus in the foreground. Johnny Mercer, one of the most prolific and influential songwriters from the golden age of American popular music, was born in Savannah 100 years ago this November. He wrote more than 1,500 songs, including more than 100 hits, from 1933’s “Lazybones” (with Hoagy Carmichael) to 1961’s “Moon River” (with Henry Mancini). In an era when the dominant songwriters were holed up on Manhattan’s Tin Pan Alley, Mercer brought a Lowcountry Southerner’s appreciation of African-American dialect, jazz and the natural world to popular song. This Georgia giant will be remembered in a variety of ways in the coming months, including a reception Friday at the Avery Gallery in Marietta that will bring together artists, filmmakers and others responsible for a panoply of Mercer memorials. Attending the Avery reception will be Savannah sculptor Susie Chisholm, whose life-size bronze of the dapper Savannahian has been cast by a Utah foundry. Chisholm sculpted the piece from a familiar image of Mercer leaning against a fire hydrant on a Manhattan street corner, in topcoat and fedora. Mercer’s great-nephew Steve Gerard served as a contemporary model. Chisholm will bring a 17-inch version of the Mercer statue to the Avery Gallery, while the life-size version will be installed in Ellis Square in Savannah and unveiled on Nov. 18, Mercer’s birthday. Mercer was nominated for 18 Academy Awards and won four (including best original song, with Mancini, for “Days of Wine and Roses”) and movies featuring Mercer songs are in heavy rotation this year around Georgia and the world. Georgia State University will host a four-day Mercer film festival in October. In November at the Rialto Center for the Arts, Atlanta will see the premiere of “Johnny Mercer: The Dream’s on Me,” a documentary from executive producer Clint Eastwood, produced and directed by Bruce Ricker of Rhapsody Films. Rhapsody is responsible for excellent documentaries of such jazz artists as Tony Bennett, Charles Mingus and Sun Ra. Georgia State University, which houses Mercer’s papers in its special collections, will host a two-day conference called “Popular Music in the Mercer Era, 1910-1970” in November. Kevin Fleming, popular music archivist at the GSU library, will also attend the Avery Gallery event. Also on hand at the Avery Gallery will be Ken Boyd of Marietta, publisher of “Johnny Mercer: The Life, Times and Song Lyrics of Our Huckleberry Friend,” first published in 1982, and brought back into print this year. 6-9 p.m. Friday. Free. Avery Gallery, 390 Roswell St., Marietta. www.averygallery.com.